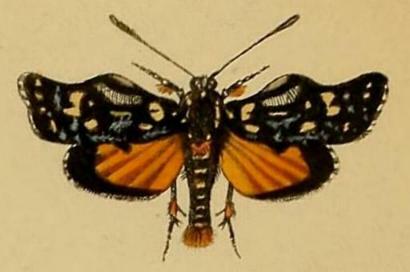 The forewings of the adult moths are black with white markings, and the hind wings are orange with a black margin. The males are smaller than the females, but have a curved transparent 'window' in each forewing. The males make a clicking-whistling sound when flying. This is made in flight by a ribbed area on the forewing rubbing against a small protrusion. The noise is probably used to attract females. The moths fly in the daytime. 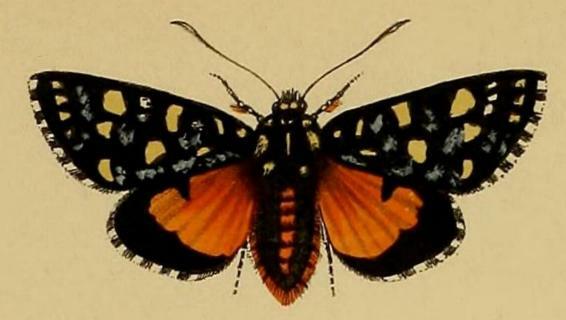 The striking colours suggested that the adult moths might be poisonous and aposematically coloured, especially as the larvae feed on poisonous plants. However, recent research has investigated this and found that the moths are not poisonous for predators to eat, and that the moths possibly evade capture by employing a very erratic flight pattern. Volume 237 (1995), pp. 337-352. Melbourne University Press, 1990, pl. 22.25, pp. 51, 464. Entomological Society of Victoria, 2017, pp. 32-33. Volume 42, Part 3 (2003), pp. 276-280. Part 31, Supplement (1865), pp. 58-59. CSIRO Publishing, 2007, p. 14.